Needed an excuse to try out these dip cups. 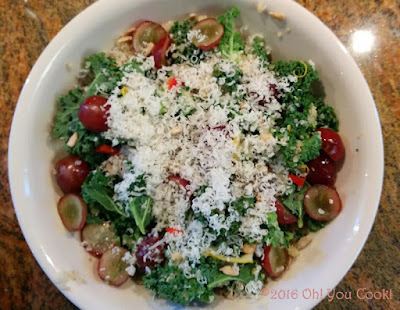 Tami's recipe is so simple there wasn't any need for quantities. But as long as I made a couple of small changes I tossed measurements in, no extra charge. Tami used a ready-to-eat cheesecake filling. I had some whipped cream cheese leftover from a bagel brunch, so a little powdered sugar plus lemon juice whisked in created a nice clone. 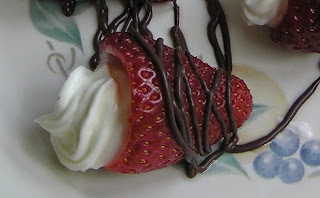 Somehow I managed to blip over the part about first dipping the strawbs in melted chocolate, so that step was omitted. But the end result is so pretty that I think I'll make the same mistake next time I have a hankerin' for these babies. Thank you, Tami! 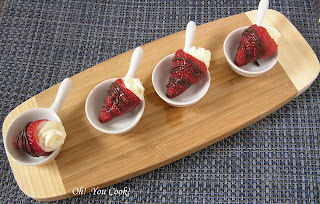 Place a sheet of wax paper on a plate (something I forgot to do), then place the strawberries on top of the wax paper. Cut the tops off the strawberries. Carefully scoop out some of the center with a grapefruit knife, avoiding nicking the sides or the cutting all the way through. Eat the centers. Set the tops aside in case you want to pop them back on later. Then discard them when you change your mind. 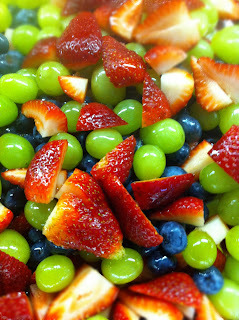 Set the strawberries aside; those you'll need later. In a small mixing bowl, whisk together the cream cheese, sugar and lemon juice. Clip a small corner from a plastic sandwich bag and push a star tip through from the inside. 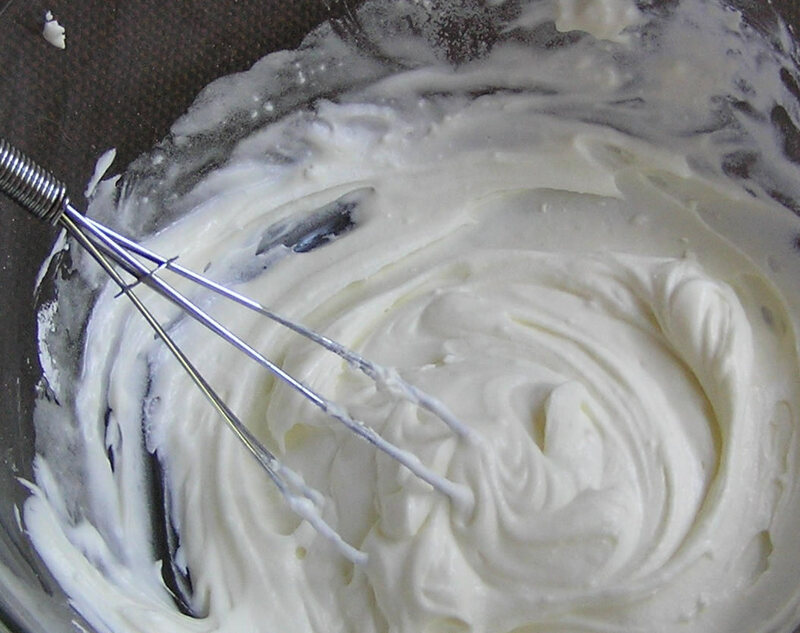 Spoon the cream cheese mixture into the bag. 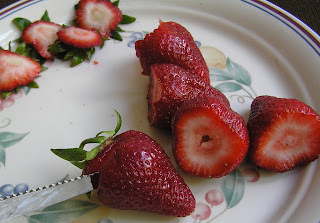 Holding the bag closed, pipe the mixture into each strawberry. You don't really need the tip, but the strawberries look a lot prettier topped with swirled filling. Note the window reflected in the spoon. No photoshopping, BTW. Nuke the melting chocolate for a minute. 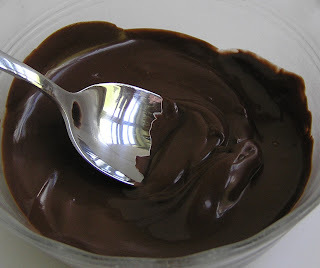 Stir, then repeat the nuking every 30 seconds until the chocolate is completely melted. Really should have done this over waxed paper. Oh, well. Spoon the melted chocolate into a fresh bag with a tiny corner snipped off. 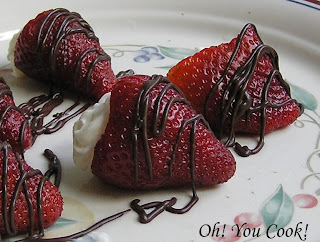 Squiggle the chocolate over the strawberries. Pop the berries into the fridge to set the chocolate up to a couple of hours. 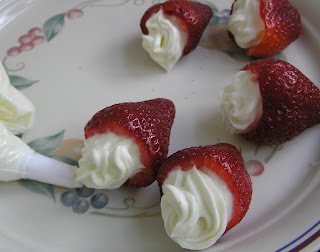 Transfer the strawberries onto something decorative just before serving. this is pure poetry in shape of dessert... I want some. Right now! I’m visiting from Group D, and love what you did this month! Beautiful (AND delicious, I’m sure)! This would be wonderful for Mother's Day, wouldn't it? All I can say is Wow... What a decadent treat these would be. These are stunning!! We did similar ones for my son's V-day party this year at school. 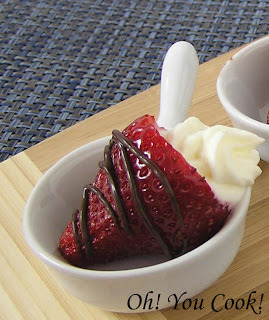 They looks like perfect bites and sooo enticing!!! so cute. both the berries and your little dishes! haha.. i love putting porcelain on wood. it looks elegant yet rustic. well done! yum! 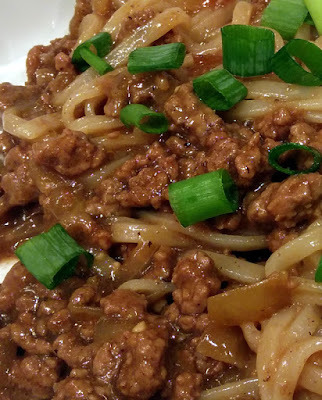 these sound delicious + i love how easy they are. 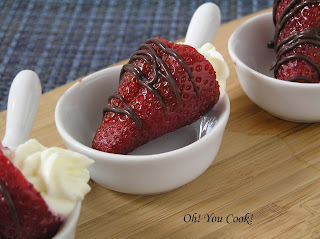 what a great dessert idea for a party! Such elegant little bites of pure pleasure. Perfect for a spring and summer buffet table.